“I work for sharks, they are everything to me,” says Madison Stewart. The 21-year-old Australian underwater filmmaker has been swimming with sharks for over a decade and has made it her life's mission to protect them. She never set out to be a ‘conservationist’, in fact she dislikes the word and maintains that she is not one. She is however, deeply moved and outraged by witnessing in the short space of her own lifetime, the decimation of a species she considers her family. Over the last seven year’s she’s campaigned against the shark meat and shark finning trade in Australia, Mexico, Fiji, Palau and in other locales. 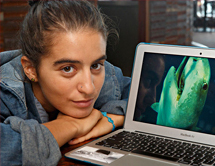 This past year she became the subject of an award-winning Smithsonian documentary, “Shark Girl.” She believes the most important career she can hope to be involved in, is the protection of this planet, and thus her own future. She wants a future with sharks in it, and this is the end she is fighting for.